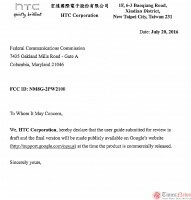 We all know HTC is making not one, but two Nexus smartphones scheduled for release later this year. Both Nexus Sailfish and Nexus Marlin have starred in various leaks already revealing some specs and design through leaked pics and mockups. 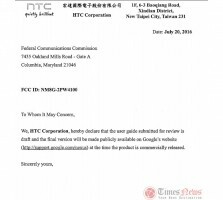 Now, we have evidence both Nexus smartphones have passed through FCC and are approved to work within the USA. Verizon is set to offer both devices, so that's hardly a surprise, but it means that their development is close to completion. The Nexus Sailfish should be the Nexus 5X successor with a 5" 1080p display, Snapdragon 820 (or later) chip with 4GB RAM, 16/32GB storage, 12MP/8MP camera setup, and 2,770 mAh battery. Pure Android 7.0 Nougat will oversee the Sailfish, of course. Today we saw new leaked pictures of the Sailfish and while we still can't lock the choice of materials, it's a nice update. The Nexus Marlin will offer a 5.5" Quad HD display and run on the latest Snapdragon 820 (or later) chip with 4GB RAM. It should offer the same camera setup as Sailfish, but bump the storage options to 32GB and 128GB, and the battery up to 3,450 mAh. We'll know more later this year, but the Nexus fans may want to start choosing teams right now. Using more ram drains the battery more. Obviously. Just Google it. And it was the reason why the op3 had aggressive ram management and made the 6gb ram phone effectively act like it had a lot less. Completely wrong. Google will help your IQ, if you let it.